As we have learnt from the first two blogs in this series, the oceans around the Galapagos Islands are a unique environment, home to incredible creatures of all kinds. If you missed the last blog, you can read at A Special Archipelago Part 2: Marine Life. In this blog we will be looking at how the ocean currents have affected the climate of the Galapagos and what this means for terrestrial life living here. The Galapagos has an uncharacteristically dry and moderate climate for an Archipelago on the equator. They are not tropical like most equatorial locations, instead being cooler than expected but they do remain mild all year round. The seasonal differences on the Islands are marked by differences in precipitation and cloud cover rather than temperature. A cooler, dryer season runs from June to December with more overcast skies and occasional drizzle. During this season, plankton blooms in the oceans raising productivity and increasing food abundance. This causes a lot of activity in the water and brings whale sharks to the Galapagos. Due to the cooler climate and abundance of food, this season is also the breeding period for many sea birds and shore birds, marine iguanas, sea lions and fur seals. A warmer, wetter season occurs between January and May. The Galapagos climate during these months is characterised by reduced winds, warmer seas, rain clouds and daily afternoon showers at higher elevations. However, even during this season the lower elevations receive only a little rainfall but do benefit from water flowing downhill. 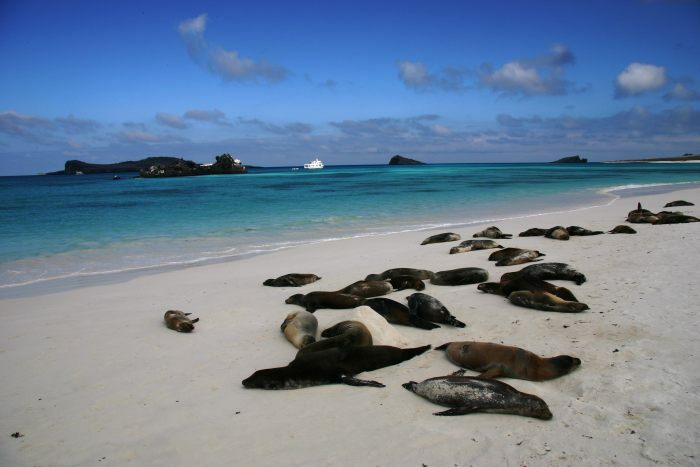 Like most other phenomena in the Galapagos, the climates are driven by the ocean currents. The Humboldt Current is a cold water current flowing north from Antarctica up the west coast of South America. When the current is at its strongest it brings cold winds to the Islands which causes the dry season by reducing sea water evaporation, the amount of clouds that form and so the amount of rains that fall. During the wet season the winds and the current is weakened which creates warmer surface temperatures, increased evaporation and so more rainfall. Many animals are impacted by the changing climates as the weather changes and food abundance fluctuates. Some Galapagos giant tortoises on Santa Cruz Island migrate up to 10km to the highlands in the dry season in search of food in the misty forest before travelling back to the lowlands in the wet season. The Giant Tortoise Ecology Movement Programme is tracking individual tortoises to see where they move throughout the year. Visit Tortoise Trackers on Discovering Galapagos to find out more. In the next blog, we will be looking at the location of Galapagos and how animals arriving on the Islands have evolved without influence from the mainland. To find out more about the subjects discussed in this blog visit the Weather and Climate and Special Archipelago sections on the Discovering Galapagos site.